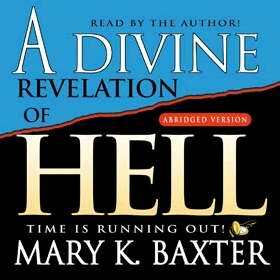 Divine Revelation Of Hell Abridged is an audio book by Mary Baxter. Mary reflects on a time in her life were over a period of forty days God gave her visions of hell. Mary also gives listeners an account of the place and beings of hell contrasted with the glories of heaven. The book also delivers messages of the miracle of salvation. Divine Revelation Of Hell Abridged - Audio CD by Mary Baxter was published by Whitaker House in April 2005 and is our 23491st best seller. The ISBN for Divine Revelation Of Hell Abridged - Audio CD is 9780883689486. Be the first to review Divine Revelation Of Hell Abridged - Audio CD! Got a question? No problem! Just click here to ask us about Divine Revelation Of Hell Abridged - Audio CD.